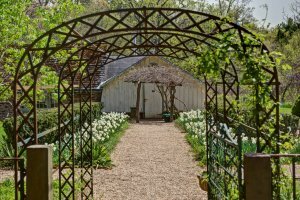 See what's in bloom at the open house and guided tour of Montgomery Place's lush, colorful perennial garden and colonial revival herb garden. A 1929 Hitchings and Company Greenhouse and potting shed is featured and is still in use today, with updated 21st. century technological innovations. Learn about the garden's plants and flowers as well as some of the historic figures who nursed them from the early to mid twentieth century. Open House hours are 11 AM - 3PM, a guided tour begins at 11 AM.